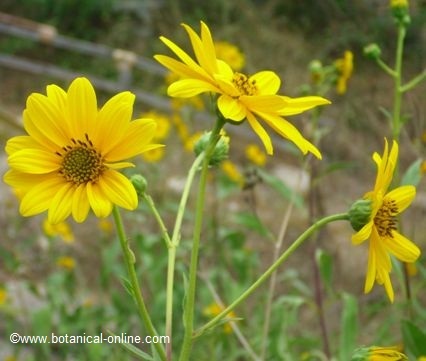 – Jerusalem artichoke (Helianthus tuberosus) is a plant of the Compositae family, related to sunflower, grown for obtaining its tubers, which are edible. – Annual plant up to 3m. tall. – Stem erect, rough and reddish, with numerous ramifications. – Leaves are alternate, large, stalked, oval-lanceolate, toothed. – Flowers radiated forming blackish florets and ray florets with yellow flowers. – It blooms in summer. Fruit in achene, 5 – 7mm. – Roots thickened forming tubers, pale brown, red, purple or white, rich in inulin. – Plant from tropical and subtropical climates, native to eastern North America, and introduced in Europe in the seventeenth century. Nowadays naturalized in this continent. – Average temperatures from 18 to 26 ° C.
– It can grow in the same places where you can plant potato and corn. – It tolerates frost, although it does not flourish in very cold climates. – Altitude between 300 and 650m. above the sea level. In India, it is described in altitudes of 3,600 m.
Ecological amplitude: H. tuberosus can be preferably grown at 300-750 m altitude (in India up to 3600 m). Agricultural areas, disturbed areas, grass and moorland, lakes, riparian zones, under human direction, urban areas. Habitat in the Netherlands: In moist, nutrient-rich, sandy or loamy soils, especially along rivers, riverbanks and roadsides. Rustic plant that can grow in poor soils, but thrives best in areas rich in organic matter. Loamy and loose soil, sandy or clayish. It does not tolerate waterlogging, which promote disease development and hinder the growth of the tubers. PH between 4.5 and 8.2. Labor soil deep at least three weeks before planting. Plow the soil surface before plantation to condition it for planting. Control of weeds periodically during cultivation. 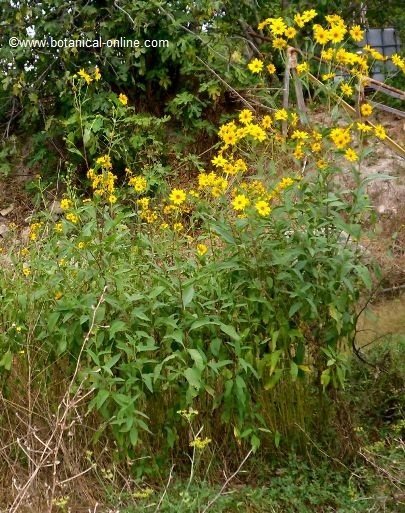 However, this plant eradicates surrounding weeds, because it becomes so dense that few plants can compete. Usually invasive. Control of rodents and moles, which can attack the rhizomes. Control slugs coming to consume the entire aerial part of the plant. Use of fertilizers to produce better crop, amount of fertilizer: 484 or 4124. – Jerusalem artichoke reproduces itself vegetatively by transplanting their tubers. This feature makes it an invasive plant, since it is difficult to eradicate all tubers. – Plant the tubers in spring, as soon as the soil can be worked. Late planting reduces production. – Whole tubers are planted or pieces of approximately 50g. as if they were potatoes. – Cover the remaining tubers to a depth of 10cm. – The tubers sprout after about 10 to 17 days after planting, when the soil temperature is at least 6 ° C.
The tubers are harvested in late autumn or winter. These are small, so gathering them is quite laborious. 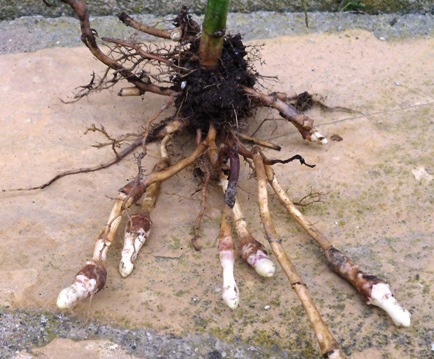 It is almost impossible to harvest all tubers a plant produces, and possibly the following year new shoots will appear in areas close to the crop. The leaves, which are used for animal feed, can be harvested before flowering. Winter frost will blacken and make leaves fall to re-sprout in spring next year. White mold (Sclerotinia spp. ): It causes early wilting of the leaves and stem and tubers rot.